"Life Journeys": Conversations With High Achieving Women In Kenya, Week 3 - Women of the Week. 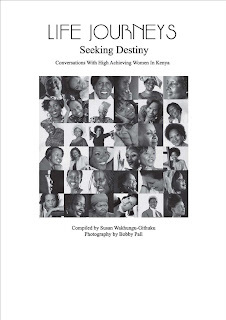 Conversations With High Achieving Women In Kenya, Week 3 - Women of the Week. This week we keep it going, as our blog gets bigger and more popular, thanks to you all. Our Women of the Week are Entrepreneur Gina Din Kariuki, Conservationist Dr. Paula Kahumbu, and Olympian and Philanthropist Lornah Kiplagat. Enjoy and follow us for excerpts from our books and updates of our upcoming publications. Gina Din is the Managing Director of the highly successful and well renowned Gina Din Corporate Communications, which won Best Public Relations Company in Middle East and Africa at the Stevie Awards in 2010. This Entrepreneur is a loving individual with a big heart visible through her active involvement with the Kenya Red Cross as a Goodwill Ambassador. This is an excerpt of her story from "Life Journeys: Seeking Destiny." " I was brought up in Nanyuki, where my parents owned and ran the Sportsman's Arms Hotel. As the youngest of four sisters, I was the baby of the family. We were not your typical stay-at-home family, as most of our time was spent in the Hotel. I was a terrible student in all the schools that I attended. My teachers and practically everyone else wrote me off, thinking that I would not amount to much. This negative view spurred me to prove them wrong. Although I succeeded, I still regret not having done well at school, because if I had, my father would not have died thinking that I was a failure. Though he did not say this, I wish I had brought him better grades. Now that I am a mother, I cannot imaging my children bringing home bad grades. My other hero is Mother Theresa. Her love for people and acts of charity left a mark in the world and inspired me. Since 2008, I have been a Goodwill Ambassador for the Red Cross and this gives me the opportunity to help others. Helping others is truly fulfilling. Dr. Paula Kahumbu is an Ecologist and Conservationist with a Doctorate from the prestigious Princeton University. She is the CEO of Wildlife Direct Incorporated and the recipient of the 2011 National Geographic/Buffett Award for Conservation Leadership.
" Working in an office is my greatest challenge! I love the outdoors and I always want to be with the wild things. At Loreto Convent Msongari School, my love for the outdoors was instilled further. Although it was a Catholic school, it had an enormously diverse student body, where religious, tribal and racial tolerance was part of the culture. I did not know that race was an issue until I went to University and realized that melanin was a problem. Dr. Leakey took me under his wing, taking me to visit remote protected areas and generally encouraging me to pursue the highest academic excellence in this field. He will always be one of my heroes because of his wisdom. So will Jane Goodall, because of her influence on my life; and Charles Darwin, for daring to suggest we evolved at a time when people were not ready to hear it. Lornah Kiplagat is a Professional Runner, Olympian, Philanthropist, and more importantly, Kenya's Champion. She is the holder of many medals, and honours including recipient of the United Nations Millennium Shoe Award. I was brought up in a Christian community and I remember hearing a lot about Russia and Communism when I was young. My dream was to go there and teach the people about Christ. Another dream was to become a doctor and treat people, so that I could help them get well. I believe that there is no greater achievement in life than having a positive impact on people's lives. That is why I wanted to travel, to enjoy the experience of meeting new people and learning new things. To become a doctor was a challenge because you had to be academically inclined to practice medicine and I was the complete opposite. I would never study or take notes in class. I would just sit at my desk, read the textbooks and listen to the teacher. I wanted to learn things you cannot learn in the classroom and I did not like to be taught. I preferred to teach myself. I am constantly inspired by women and their achievements, expecially the women who wnat to change the world and help in one way or another. When the opportunity came, I felt the need to help young women and in 2000, the Lornah Kiplagat Foundation was established. The Foundation focuses mainly on giving young girls and education and it represents the person that I am and the life that I have had. I feel that the problems in Kenya can be solbed through education as the more girls study, the more independent they become. I have greast respect for all young children and their different backgrounds, no matter who they are.